I met _____ at this event and she is starting a new business here in Denver. She is looking to connect with other business owners, female entrepreneurs and has some questions about social media/networking. I’ve cc’d her on this email and I hope you guys can connect soon! After reading the email I immediately responded eager to learn more about this person, and see how we could help one another. We set up a time to connect via phone, I sent a calendar invitation with two reminders and gave my phone # as the number to call. The day before our call I do what any good networker does, I prepared. I spent time looking at the new contact’s LinkedIn profile, tried to find her website and researched the general industry she works in. Alyce: It’s great to connect, did you see my email? New Contact: Yeah, I was actually sleeping and totally forgot about the call. My phone buzzed when your email came through, which is what woke me up. Alyce: Oh, ok, great. I’m glad I sent the email! New Contact: Yeah, so anyways I don’t really know why I’m talking to you, but I guess I’m supposed to be networking so I can get more clients. Alyce: Well, our mutual friend suggested we connect and I’d love to learn more about what you’re doing and why you’ve chosen this type of business? New Contact: Oh, ok. Well, um, I started this business because my sister basically forced me to do it and said I would make a lot of money and I hated my old job so yeah, that’s really why I’m doing it. I guess I’m looking for help with social media and need someone who can really explain why I need to use social media and what I specifically I should be doing on social media to get more clients. Alyce: I’m happy to share a little more about what I do and give you some names of people I know who specialize in social media coaching for new businesses if that would be helpful? New Contact: Yeah, what are their names and how much do they charge? Alyce: I’m not sure how much they charge but why don’t I send you an email with their contact and you can research them and then I’m happy to make a virtual introduction if you want? New Contact: ok, yeah that would be good, thanks. New Contact: Ok, well thanks for your time, I actually have to run, but I’ll look out for your email. Alyce: Oh, ok, sounds good, bye. Wow. I hung up the phone and was in utter disbelief. I know that networking isn’t easy, nor is it something familiar to many folks out in the big bad world, but c’mon now! This interaction made me realize that there are a lot of people who have no idea how to network in a productive, symbiotic way and so I want to share a few quick tips that could have made this call a lot more productive for both people involved. Be On Time: Whether you’re meeting someone face-to-face or via phone, make sure you’re managing your time and being respectful of the other person’s time. If you’re going to be late or need to reschedule, no problem! Just make sure to communicate that as soon as possible so that the first impression you leave on the other person is one of respect, professionalism and compassion. Own Your Mistakes: This new contact flat out told me that she was still sleeping and that the only reason she woke up was because I sent her an email. In hindsight I never needed to know that! In fact, when she told me that I was so turned off that I got up from my computer and starting to clean my kitchen! Yes, all it takes for someone to lose interest is one sentence that clearly indicates a lack of respect or care about someone else’s time and schedule. She never needed to tell me that she was still sleeping...a thoughtful apology or “I’m so sorry I was late to the call” would have been totally acceptable and would have kept me engaged in what she was saying. 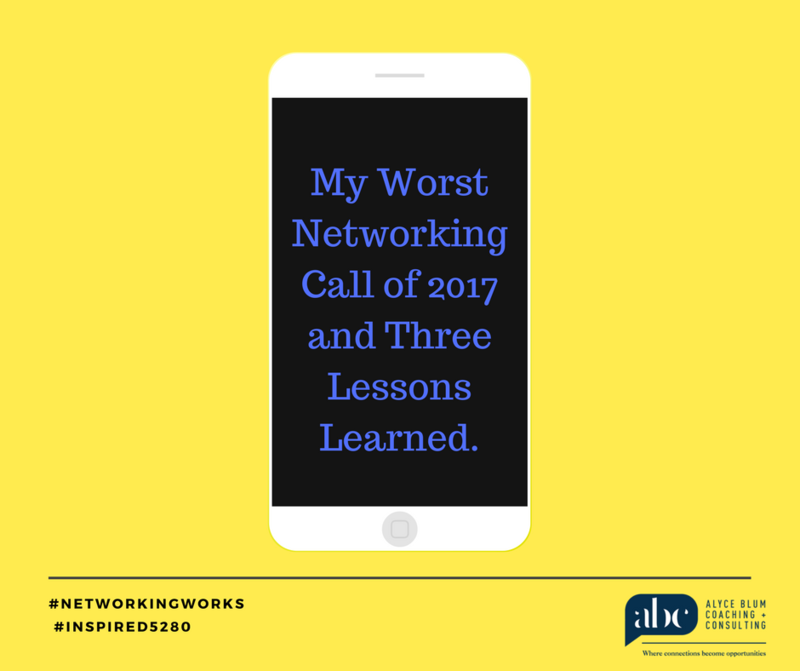 Don’t Let One Bad Apple Spoil the Bunch: I expanded my network by 350 new connections in 2017 and 98% of those connections were kind, thoughtful, smart, innovative individuals. Now and again I would meet someone who rubbed me the wrong way or was flat out rude, like the woman I described in this blog. When I hung up the phone I was so annoyed and worried that this is how other people view and experience networking. For a split second it made me second guess what I do and the effectiveness of networking. But, I snapped out of that ridiculous cave of self doubt and remembered all of the amazing people I’ve met and helped and who’ve helped me via networking over the years. At the end of the day, don’t let one conversation or one ‘bad apple’ ruin the endless opportunities that defines networking and it’s incredible powers to build businesses, trust and most importantly life long friendships. I’d love to hear from you! What’s the worst networking call you’ve experienced? Please share on my facebook page so that we can all learn from one another and share tips so that we can show up as professional, thoughtful and effective networkers!